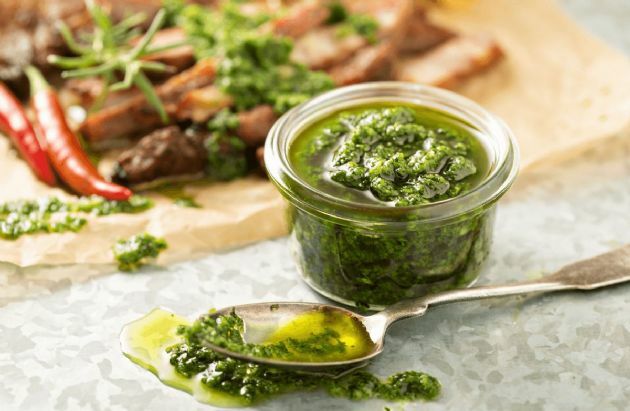 This sauce hails from Argentina, a country that's known for tasty grilled meats. Pair this with grilled beef, pork, chicken and even fish. It's also a great dipping sauce for grilled vegetables and whole-wheat bread. Combine all ingredients except for the olive oil in a food processor or blender. Slowly add the oil in a steady stream with the motor running. Keep covered and chilled in refrigerator for up to one week. Serving Size: Makes 2 cups, 2 tablespoons per serving.